2 x Volvo D4 260hp with DPH legs with only 500 hours!! Still under Volvo warranty up to 1000hours or 2 years with option to extend . 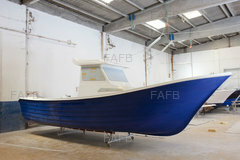 With only 500 hours on the clock the boat is in excellent condition. 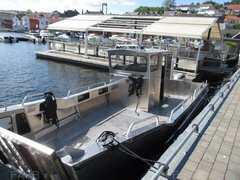 This boat will cruise anywhere from 16knots to 30knots and max out at 35+ . with full fuel tanks and full crew . 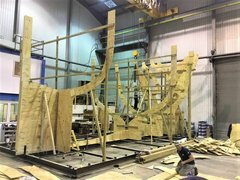 With its very high bow it takes rough weather with ease combined with a massive deck area and one off looks this is one serious charter boat ! The boat is lying in Cardiff and has just been fully serviced washed and waxed ! This is one serious boat that stands out from the rest and with the speed will give your customers more time fishing and less time traveling and cost next to nothing in fuel . 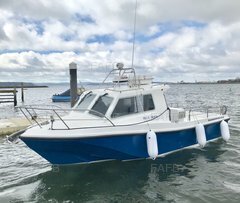 Boat is available end of September , deposit will secure.